A fullback who made sports history as the player on the receiving end of the “immaculate reception,’’ and as a Pro Bowl member of four Super Bowl Champion Steelers teams. 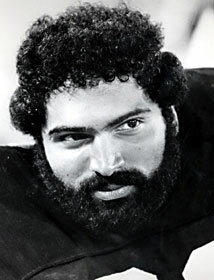 Franco Harris was born March 7, 1950, in Fort Dix, New Jersey and first won fame as a fullback at Penn State University under Joe Paterno. Though overshadowed at times by halfback Lydell Mitchell, he was a first-round draft pick of the National Football League’s Pittsburgh Steelers in 1972. Harris quickly made his mark, rushing for 1,055 yards in his first season and winning Rookie of the Year honors. In the AFC Playoffs, Harris was on the receiving end of the “immaculate reception,’’ one of the most remarkable plays in sports history. When a pass intended for a teammate took a wild bounce off a defender, Harris plucked it out of the air and rumbled 42 yards to the end zone, completing a 60-yard pass play in the final seconds for a Steelers victory. Harris was selected for nine consecutive Pro Bowls, from 1972 to 1980. He won four Super Bowl rings with Pittsburgh, in 1974, ‘75, ‘78 and ’79. Harris played for the Steelers until 1983 and spent one season with the Seattle Seahawks. He retired with 12,120 rushing yards, 2,287 receiving yards and 100 touchdowns. Harris was elected to the National Italian American Sports Hall of Fame in 1988 and the National Football Hall of Fame in 1990.